Exports photos into multiple directories, optionally based on it's keywords. The trial version tells more than 1000 words. A company, asks for the photos to be delivered in separate directories per employee. Group photos are exported to every persons directory. Demo of the "Keyword exporter"
Lightroom is unable to export photos into multiple folders, optionally based on it's contents i.e. it's keywords. Driven by keywords, you can export your photos in multiple directories/folders, without moving, copying. For some clients this is a real time safer in their workflow. Download the trial version and experience for yourself! This version has all the functionality but limited to 5 images. During the export the plug-in will retrieve all keywords and based on them it will export the photos in directories with the keyword name. If a photo has multiple keywords the photo will be copied into multiple directories. Also, you can enter "General folders" which are always created. For example. During a photo shoot all the employees where photographed, both individually and as a team. When exporting each portrait of an employee is copied in his/her directory and the team photo is copied to all employee folders. Multiple keywords can be entered in the text boxes. The individual keywords should be separated by a comma. When checked, "General folders" will always be created independent of the keywords and all photos in the export will be added to them. Multiple directories can be entered, separated by a comma. General folders can be combined with keyword folders. All keywords are exported except those entered. When using a white-list or a black-list, the keywords should be separated by a comma. All employees of Shell have been photographed. As keywords, the company name, team name and employee name have been entered. Use case 1: when exporting you want to ignore the company name keyword, since it is always the same. Solution: create a black list filter with Shell. Use case 2: when exporting you want you export all employees based into directories based on the team name. Solution: create a white list with the team names, separated by a comma. Use case 3: as use case 2 AND all the photos should also be exported to a directory call Wordpress. Solution: since "Wordpress" is probably not a meaningful keyword and all photos should be exported to it, enter "Wordpress" as a general folder. 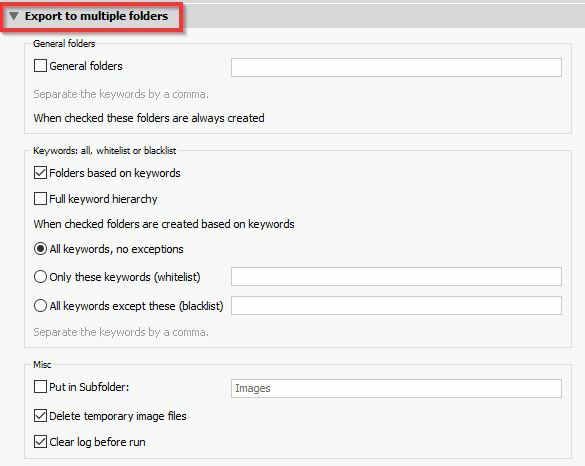 It is possible to create a sub folder inside the keyword folder. In this case the images will be exported to the sub folder instead of the parent keyword folder. One client used it to export to an "images" folders. Afterwards they created other folders like "Documents" etc. 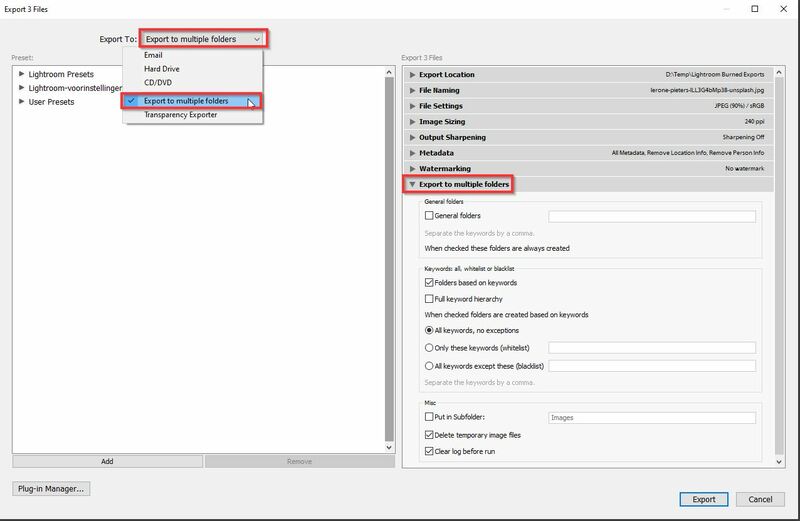 Choose "Export to Keyword folder" from the "Export To" droplist at the top of the export dialog, see sample image below. You may download and try the plugin for free, subject to its trial limitations. To unlock the full functionality you will need to purchase a copy. Payments may be made via Credit Card or PayPal, and are securely processed via our payment partner - Paddle. Note that VAT will be added for European customers.